Home Photo Tips Got a Fancy New Camera for Christmas? What Now? Got a Fancy New Camera for Christmas? What Now? So, did you receive a fancy new camera for Christmas? If so, congratulations! It’s always exciting to get a new toy. At first your new camera might seem a bit complicated and you may be asking yourself what are all those buttons are for. And what are all those settings? Now that you have a new camera, where do you start? Pretty basic, right? If you want to learn what all those buttons are for on your new camera, reading the user manual is the best way to get started. After you have read the manual, search online for how-to instructional videos for your specific model on YouTube. If you don’t understand what the manual is trying to say or if you want a better understanding of your camera’s capabilities, settings and features, go to Amazon and shop for books on your specific make and model. Also, read Build a Resource Library for your Camera for other ideas on camera manuals, books, videos, and courses. to help you master your digital camera. Like most new Christmas gifts, make sure your batteries are fully charged or brand new before you get started. Something that you might want to look into getting for your new camera is an extra battery if it’s one of those that has to be charged. If it just takes your regular batteries make sure you have extra batteries on hand. Purchase extra memory cards so you have plenty of memory for shooting pictures. The quality of pictures you are taking determines the memory space you will need. See the article about the quality setting to learn more about JPEG and RAW pictures. See Choosing a Memory Card to learn more about memory cards and which might be best for you. If you are planning on taking pictures using the RAW file format, you need software to process your RAW files into the jpeg file format. Most new digital cameras include software to help you manage, edit, and store your images. Some software programs even allow you to control your camera using a tether your wirelessly. Canon offers their EOS Utility. Nikon ViewNX-i software lets you browse still image and video files, edit still images via Capture NX-D or video files via ViewNX-Movie Editor. Sony has their Image Data Converter which displays RAW data and can adjust the brightness or color as well as output development to a JPEG or TIFF file format. There are literally hundreds of online video photography courses available to improve your photography skills. Online courses are a flexible and convenient way to learn photography and improve your camera skills. 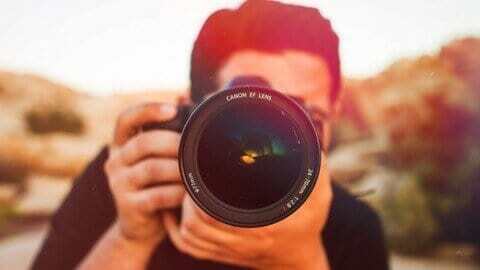 For starters, we recommend Photography Masterclass: Your Complete Guide to Photography from Udemy. You can access the course any time on your desktop, laptop, tablet, or your smartphone. The Photography Masterclass includes 13.5 HOURS of on-demand video instruction. › Beginner Photography – From Start to Finish! › Better Photography for Beginners: Getting The Basics Right! Also, check out our articles on How to Get Started in Photography and What is a DSLR Camera.